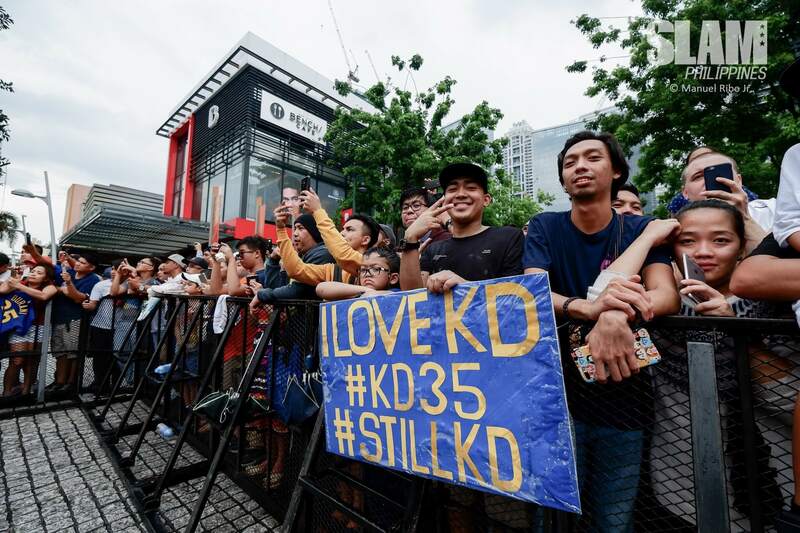 Kevin Durant entered the Araneta Coliseum on Sunday in an atmosphere fit for a rock star: flashing blue and yellow lights, billowing smoke, and blaring beats to hype up the thunderous crowd. The welcome was much deserved for a two-time NBA champion, two-time Finals MVP, one-time season MVP, nine-time All-Star, and former Rookie of the Year. Durant came out under the roar of his own mantra, being chanted repeatedly, each time getting louder, every word resonating as it peaked: Rise, grind, and shine again! Rise, grind, and shine AGAIN! RISE, GRIND, AND SHINE AGAIN! He appeared WWE-style, minus the not mean-mugging or flexing, but smiling and waving to the crowd, in a white shirt, shorts, and sneakers that said pick-up game more than rock concert. A white cap worn backwards put a nice touch to a relaxed Durant who had just won a championship with the Golden State Warriors. Again. The circumstances were different the last time Durant took the long flight to Manila (planking was a thing and Derrick Rose was the reigning MVP). 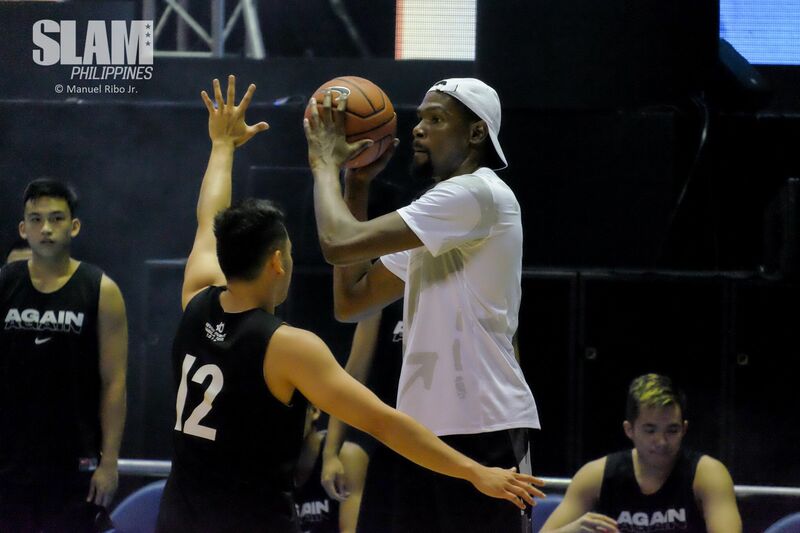 Visiting as one of nine NBA superstars looking to hoop during the NBA lockout in 2011, Durant dominated the two exhibition games played against Philippine basketball’s own superstars. He was still a member of the Oklahoma City Thunder then, and at 22 years old, still chasing that elusive first championship. 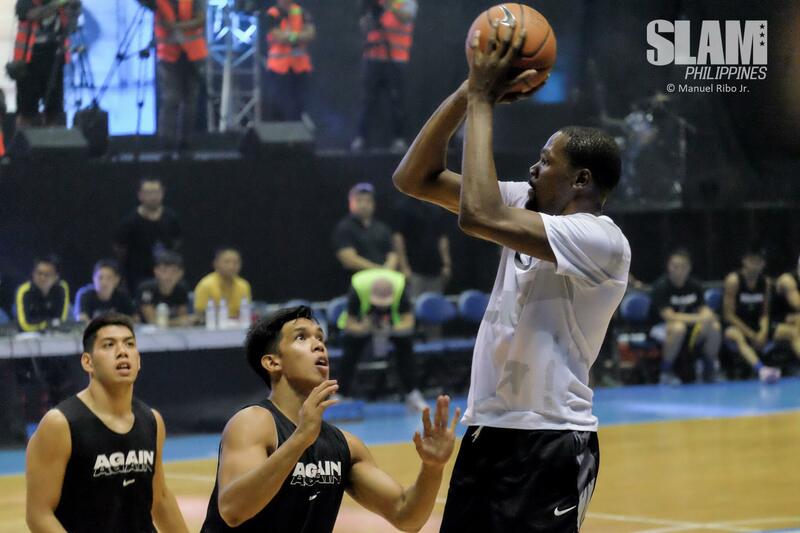 In this visit, Durant has not much else to prove on the court. This time, he’s the man at the center of it all. Some of the country’s elite college talent got a chance to play with Durant in a 20-minute scrimmage that featured several tomahawk dunks, alley-oops, and splashes. Durant, obviously on vacation mode, struggled with his shot for the most part, and instead attacked the rim and threw a couple of assists to his high-flying teammates Juan Gomez de Liaño and CJ Perez. Ateneo’s Matt Nieto had a personal KD moment when Durant lost the white cap he was wearing all day after a two-handed dunk. Nieto picked it up on the floor, wore it, and tried to complete the highlight play with a three-point attempt, which he missed. He tried to return the cap to Durant, but the Nike endorser let him keep it. 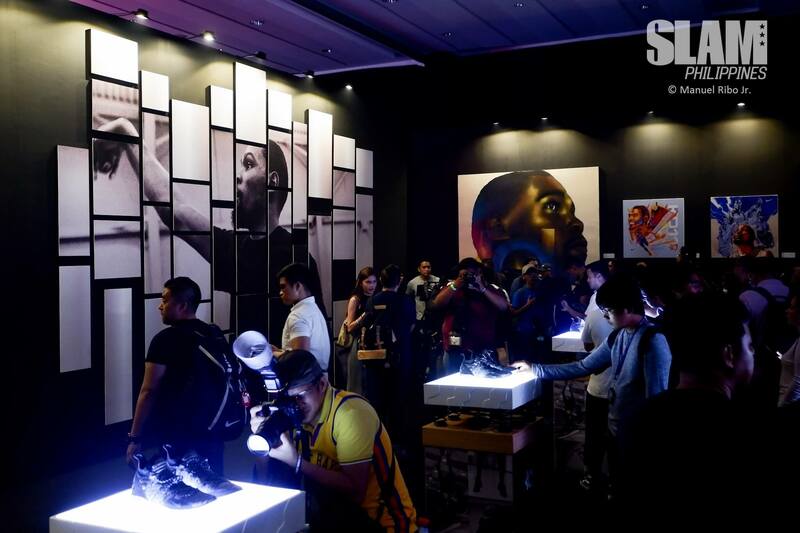 Durant’s 2018 visit to Manila is his first with Nike, as part of an Asian tour to promote the new KD11. Hours before the scrimmage, Durant and Nike designer Leo Chang talked about their latest collaboration, which Chang described as the “most comfortable” one yet. Durant and Chang switched it up for the KD11 by pairing the comfort of the full-length Zoom with the softness of Nike’s React foam, giving it a plushness that Durant looks for in his signature shoe. The eleventh iteration of his signature shoe keeps Durant in an elite group of Nike legends like Kobe Bryant and LeBron James, whose brands stay on top of mind in hoop sneakers. “[I have to] keep working to stay in that group and that’s what this shoe symbolizes,” said Durant. 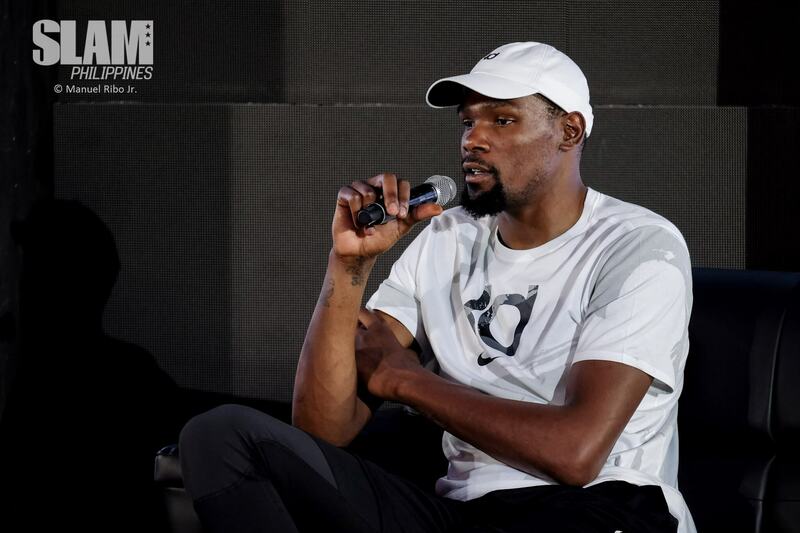 From winning championships, battling critics, meeting his fans, promoting his shoes, inspiring kids to rise, grind, and shine, Durant likened his journey to a movie, one that he’s in the middle of, one he’s trying his best to stay on. “There are so many different emotions that go in this journey. I’ve learned a lot from basketball that I’ve applied in my personal life,” he said. Durant, in front of the media, looked both calm and excited at the same time at the mere mention of his new teammate DeMarcus Cousins, who signed with the Warriors for next season. Adding another All-Star to a team of All-Stars will do that. “I don’t see how everybody let him fall to us but I guess we ruined it,” said Durant, referring to criticism that a superteam like the Warriors is ruining competition in the NBA. He believes that Cousins will break the monotonous hum of dominating the league, which at times seemingly threatened to break the team. “Last year was just the same, was just repetitive over and over again and we needed an injection of energy and I think DeMarcus is going to provide that for us,” he said. Thoughts of a three-peat are no doubt in Durant’s mind, but he’s also aware of the hard work that is required of him to stay on the top of his game. He has to stay hungry and keep on shooting, whether he’s going for the dagger in a Game 3 Finals in the Q or engaging in an impromptu shootout with Isaac Go in a scrimmage in Araneta. 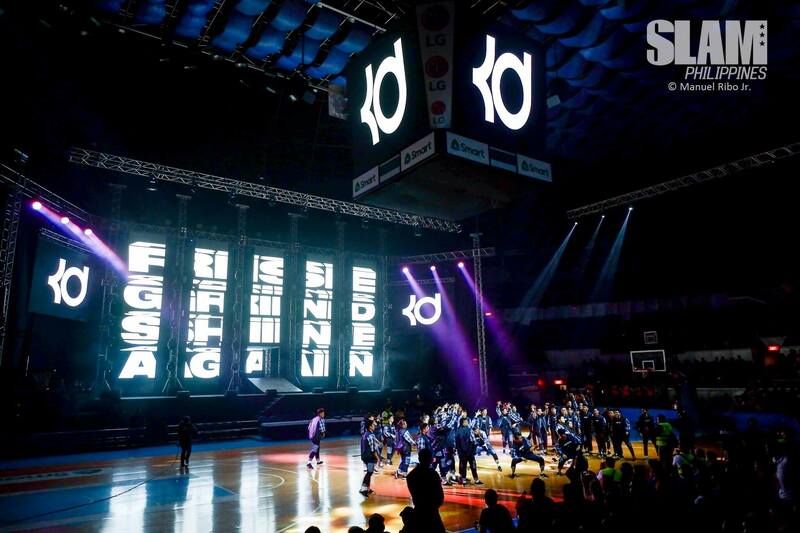 For 20 minutes, Go and the young college stars from the UAAP and NCAA took turns in showing Durant what they can do on the court, that they too can rise, grind, and shine like their visitor. They didn’t shy away from the challenge. It was proof that while Durant has already conquered the NBA, he now has a bigger responsibility of passing on his story of being a skinny kid from Maryland to becoming an NBA champion. Durant, despite all the accolades, still has to keep rising for those who want to see him win again. He needs to keep grinding for those who just want to see him lose. As an NBA champ, he has to keep shining for those who wait under the sun just to catch a glimpse of him; for those wearing his OKC, Team USA, and Golden State jersey; for a die-hard fan who had his face tattooed on his leg; and for hundreds, maybe thousands, future Kevin Durants shooting jumpers from across the globe.